Word has reached us tonight of the passing of Paul Mees, PTUA Secretary 1987-91, President 1993-2001. A big loss. Paul, you will be missed. I never met Paul Mees personally, although I felt I knew him at one level because of his sustained committment to better outcomes for public transport and his considerable work on the subject which I am sure many are familiar with. A fierce but sensible advocate. The National Tertiary Education Union (NTEU) notes with sorrow the death of long-standing NTEU member, Associate Professor Paul Mees. “Paul was a public intellectual with a resolute dedication to calling governments and university administrations to account,” Matt McGowan, Assistant National Secretary of the NTEU, said today. “Well-known as an advocate for public transport, Paul brought intellectual rigour to this important area of public policy. In a field where huge commercial contracts and corporate interests distort the debate, Paul never flinched in speaking truth to power. “He paid a price for this in his professional career. 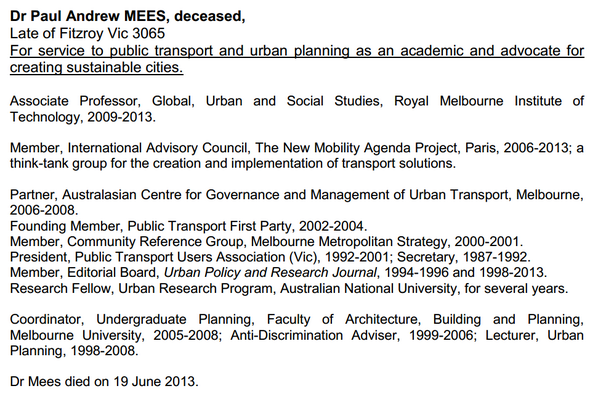 At the University of Melbourne, he was criticised by senior management for his public denunciation of the Victorian Government’s road-building fervour and of their senior transport policy advisors. “The NTEU extends sympathy to Paul’s family, friends and colleagues,” McGowan said. I met him once when we we fighting the Wooloowin Freeway!! Very funny and oh so passionate about Transport. Much of his work inspired my own passion for the Transport topic. RIP Paul. Paul drew out these ideas in A Very Public Solution, highlighting the importance of “the network effect”. He called for a radical re-design of public transport routes and timetables to create a system of connections and interchanges, timed and pulsed to reduce waiting times. Such systems allow people to forget their timetables and travel in all directions, rather than just into the central business district. And they work. His concepts were taken up in key European guidance documents and have been influential in many cities. Alas, in his hometown of Melbourne little seemed to change over the years. And we have to add Brisbane to that list of Australian PT failures. Meanwhile in Brisbane our Transport authorities are going "Paul Who?" Good send-off for Paul Mees. Could hear trams going past outside. Priest noted a miracle may be needed to stop the E-W motorway.